A few days ago I fired up my VHS machine and inserted one of the few known available copies of Robert Rossen’s terrific 1949 All the King’s Men. 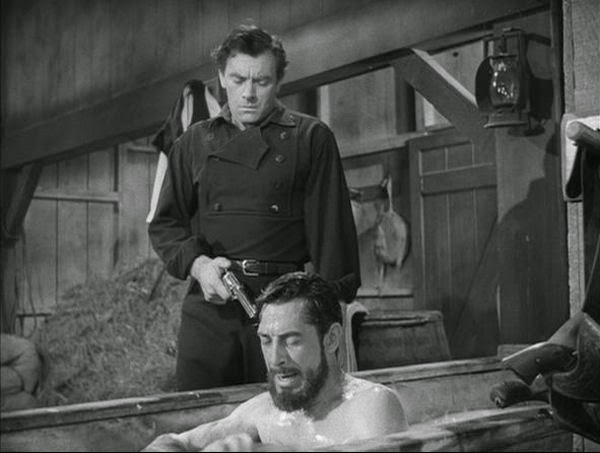 The film features a Canadian-born actor ( I mistakenly thought he was from the prairies) John Ireland. Watching his face, and because this is Christmas and Christmas is a time for reflection I remembered exactly the time I first saw John Ireland in a film. In 1949 my father and I took the train from Coghlan to Retiro, the cavernous downtown terminal. From there we stepped down escalators to the subte that took us to Lavalle Station. There we walked to one of the many movie theatres that lined that street for blocks. We were there to see (now I know the details) Bob Fuller’s I Shot Jesse James. John Ireland plays Bob Ford the man who does in James. There was something about Ireland’s face, perhaps a look of despair and or doubt that may have affected my young mind. Or it could have been that this film, even though it was a Western, had no clear villain in a black hat and a hero in a white one. I had yet to discover Hopalong Cassidy who always wore a black hat. Since that film I have always admired Ireland as the flawed, hero with inner conflicts that are patently all over his face. Al the King’s Men followed that impression I had of the man. It takes his character, Jack Burden, a long time in the film to realize the corruption within Willie Stark (played by an awesome Broderick Crawford). But in the last few seconds of the film Ireland comes through. Thanks to Wikipedia I was pleasantly surprised that Ireland, born, January 30, 1914, in Vancouver, was the first Vancouverite to be nominated for an Oscar in his supporting role in All the King’s Men. The shenanigans that I see on CNN with Rachel Maddow make all the goings on of All the King’s Men seem tame. And I always find it pleasant but curious how my memory links to events long past.